From centerpieces to the cake, decorating for a wedding is fun. Personalized ribbons pair perfectly with any event. And that includes a wedding! Use custom ribbons on your party favors, for your invitation cards, and, of course, in all of your decorating. Customize ribbon rolls with the bride and groom’s names, the wedding date and any other details about the day. Or choose a romantic phrase such as Forever Begins Today or True Love Is The Greatest Adventure. Match the ribbons to the wedding theme by choosing colors that either match or complement them. One thing to take into consideration when getting ribbon rolls for your wedding decorating is the size of the ribbon. Wider ribbons are used to decorate cakes, tables and chairs. Use skinnier ribbons for centerpieces, flowers and party favors. So, make sure to pick the width that best matches what your needs are. And don’t be afraid to mix the widths to create a unique creation in your decorating. From ribbon backdrops to simple table centerpieces, personalized ribbons are perfect for all your decorating needs. Spice up a photo booth with colorful, custom ribbons. 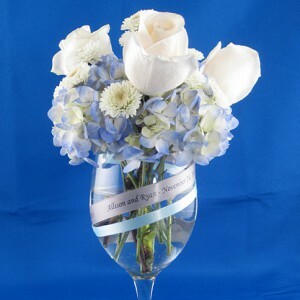 Add a unique flair to tables with cheerful and detailed ribbons tied around candle holders or even silverware. 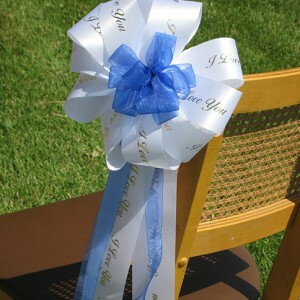 Make seating arrangements with specially made ribbons for the bride and groom. Or wrap ribbons around the back of all the seats for a more traditional approach. Drape ribbons across or around each table for added charm. Everyone enjoys a thank you. 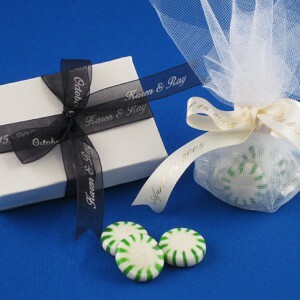 Party favors are extremely popular with wedding guests. And, making these gifts part of your decorating adds a unique charm. Wrap ribbon rolls around small bags of goodies or a box with a special treat. Or, use other custom ribbons a bit more creatively. Use full-color ribbons for a fun keepsake. Add pictures or graphics to make these ribbons something special and give them to attendees, so they remember your special day. And, of course, a wedding isn’t complete without flowers! From boutonnieres to the bridal bouquet, ribbon rolls enhance even the smallest flowers at a wedding. Add custom wedding information to any ribbon for your personalized look. 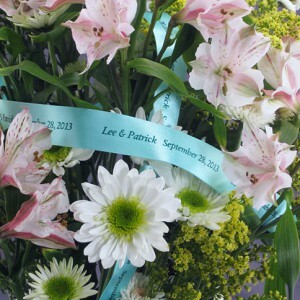 Create a romantic and ornate bouquet of flowers by adding a trail of flowing personalized ribbons. Wrap flower stems with your color and fabric choice. Hang small flower bunches from tables and wall fixtures for a fun and festive feel. Planning a wedding takes time and a lot of patience. But, no matter how simple or how lavish your wedding is, personalized ribbons will make any wedding unforgettable. Thank you, Charles, for your wit!